Learn and practice these skills to make riding safer, easier, faster and more fun. Use your heel, not your toe, to engage and disengage with your pedals. If you want to clip in and out with your right foot first, use an outward motion with your heel to disengage from the pedal. Prepare to stop by clipping out and letting your shoe rest on the pedal or dangle as your approach your stopping point. To clip in, start rolling forward by using your left foot to move the crank. Use the ball of your foot to find the leading edge of your right pedal and weight your heel to make the positive connection with your pedal. You can practice this skill on the grass at first to soften the inevitable first-time topple. The ideal pedaling cadence for road cycling is about 90 revolutions per minute. To achieve this optimal spin, you'll need to shift your gears to match the terrain. Think ahead: Read the terrain and shift into a larger gear before you start to climb. Be smooth with your pedaling as you shift gears, thinking about having a light and fluid motion on the pedals. This will promote a faster shift with less ka-chunk! and grinding sounds when changing gears. Pro Tip: Avoid cross-chaining—using both the big or small gears simultaneously in the front and back—by finding comfortable gear combinations that keep your chain closer to a straight line front to back. Prepare for corners by shifting into the gear you need when exiting your turn. Brake before you make the turn, not during or exiting the turn. If possible, you'll want to be on the outside of a curve when entering, the inside at the apex and the outside of a turn when exiting the maneuver. Keep your inside pedal up and your weight on your outside pedal. Use your bodyweight from your core to steer your bike. This is a skill that can be practiced on the grass at first to soften any slip-outs. Enjoy the ride and keep your chin up, smile (grimacing doesn't really count) and sit back on the rear of your saddle. Keep a loose grip on the handlebar tops (or brake hoods). Stand only if necessary, as it's not as efficient as pedaling while seated. Spin, don't mash, your pedals to fight fatigue and remain efficient. If you need to stand, think about staying light on the pedals—as if you were dancing on the balls of your feet. Relax and sit "heavy" on your saddle. Look ahead—a ways down the road—and think ahead, anticipating where you will be, not where you are. For maximum control, keep your hands in the drops. Apply pressure to the brake levers smoothly, squeezing with your index finger and maybe your middle finger. Control your speed with the rear brake while lightly aiding your steering with the front brake; the braking balance should feel like 85-percent rear and 15-percent front. Ideally, you'll want to ride about 10 inches to 12 inches behind the rider in front of you for optimal aerodynamic advantage. "Look through" the rider directly ahead of you, so you can anticipate their actions. You can watch their hub, glancing down at it from time to time to gauge distance; keep an eye on their rear brake to let you know when they are slowing. Unless you're climbing, ride with your hands on the brake hoods, with your index finger around the front of the brake lever, so you can moderate speed if necessary. Most importantly, ask questions from others on the ride. Cyclists are always eager to help. To minimize being pushed around by the wind, shift into a smaller ("harder") gear. Don't steer into the wind with your upper body or hands; think about using your core to stabilize yourself. When riding in a group, an echelon formation (the "V" shape migrating birds form, when flying in a group) is efficient in sharing the work in the wind. Make sure to communicate with others to understand what they are planning and how the group is moving. Riding with no-hands allows you more flexibility to consume on-the-bike nutrition or to adjust clothing. You can practice this skill by using one hand at a time, gradually sitting up, while keeping a fingertip or two on the bars, at first. Shift into a smaller gear so you're spinning a little less, or even try coasting first. This is a skill that requires some core strength and balance. When cycling for longer than an hour, you'll need to take in more than water. Practice grabbing your bottle with your left hand, leaving your right hand on the right brake hood to help modulate speed with your rear brake. This will also put your hand in a good place to easily shift gears if the pitch of the road changes. 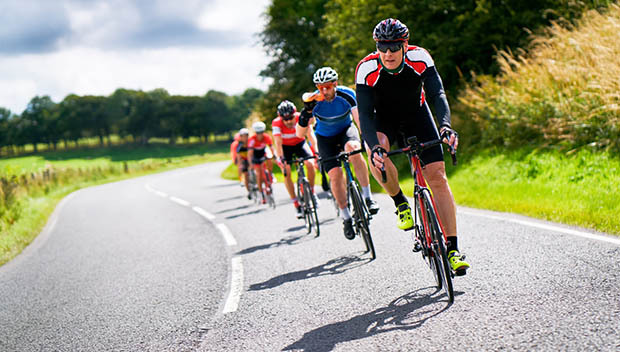 If you're in a group, keep pedaling so you don't lose the wheel in front of you. Pre-open nutrition bars or energy chews before your put the package in your jersey pocket.